As many are now aware, Norman's life did not end with a well-deserved impalement. The Green Goblin Formula that enhanced Norman's strength and intelligence was also responsible for endowing him with a regenerative healing factor. Norman survived the glider's pierce and lived in secrecy in Europe. But only a few were privy to that fact and many believed the true Green Goblin to be amongst the dead. Even some of the more powerful beings in the universe, namely Death herself, counted the Goblin amongst the deceased. On two separate occasions during the years Norman Osborn was considered 'dead', the Green Goblin was featured in a story that visited those in the afterlife. The first appearance of the Green Goblin amongst the deceased was featured in the Avengers Annual #16. In this story, the villainous Grandmaster pitted the East Coast and West Coast Avenger teams against one another. This battle caused Death herself to become involved and the distraction that followed allowed the Grandmaster (who was stuck in Death's realm) to seize control over Death. After doing so, he created 5 'life bombs' that were sent to five most distant corners of the universe to initiate a chain reaction that would destroy the cosmos. The Grandmaster's plan was to see if these two groups of heroes could unite to stop him and, of course, there was a catch. The Grandmaster resurrected what he called 'The Legion of the Unliving', which was a collection of deceased villains in which the Green Goblin was a member. The purpose of this Legion was to battle the heroes as they attempted to stop the life bombs. The Avenger teams split up into small groups to find the life bombs, and the Green Goblin attacked the group consisting of Moon Knight, She-Hulk, Captain Marvel (aka Monica Rambeau), and Tigra. The Goblin focused on the Moon Knight and even managed to expose Moon Knight to that infamous Goblin hallucinogenic gas. The Goblin's appearance was relatively brief and the ultimate defeat of the Grandmaster took place far from the Green Goblin's assault on the Moon Knight and his teammates. The Goblin's participation does not arrive a clear conclusion, so one assumed that after the Grandmaster was defeated, the Goblin returned to realm of Death. Two more post-mortem Green Goblin appearances that deserve brief honorable mentions debuted in the early nineties. 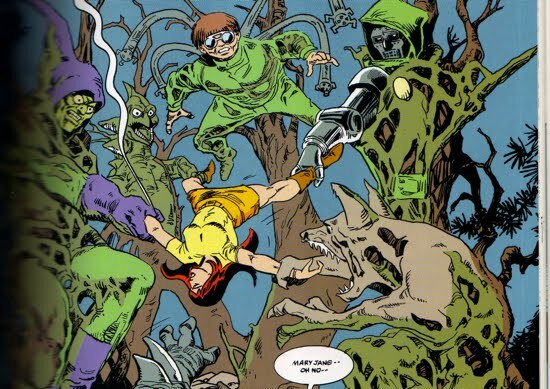 The first, from the graphic novel Spider-Man Fear Itself, features Spider-Man being tormented by the villains of his past and the Green Goblin was one of the memories that haunted Peter. The second comes from the off-beat Impossible Man Summer Vacation Spectacular #1. In that story, the Impossible Man shapeshifts into the Green Goblin to give the webslinger a brief spook. Norman and his Goblin alter ego may have been causing trouble from the realm of the dead, but some of his more infamous post-mortem meddling was directed toward his own son Harry. Granted, much of what was perceived as Norman's ghost haunting Harry was in the eye of the beholder (i.e., Harry's head), but Norman must bear some of the blame. In the midst of Marvel's demon-enriched crossover event Inferno, Harry became troubled by visions of his 'deceased' father goading him to reclaim the mantle of the Green Goblin. 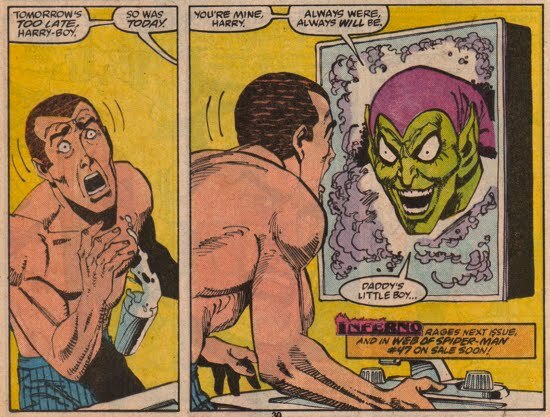 The Goblin appeared in Harry's bathroom mirror in Spectacular Spider-Man #146 and this 'delusion' (in parentheses because we know Norman didn't die in Amazing Spider-Man #122, so perhaps he did orchestrate them) sent Harry down the path of revisiting his alter ego. 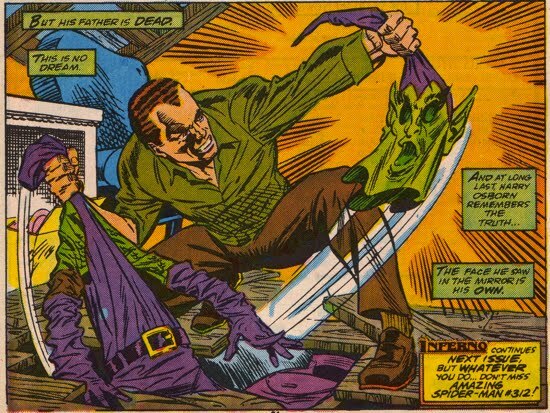 In Web of Spider-Man #47, Harry retrieved his Green Goblin costume from his attic and when on the offensive against the Hobgoblin, who had been threatening his family. Harry would eventually fend off the Hobgoblin and protect his family, but that was not the last he would see of his father's ghost. 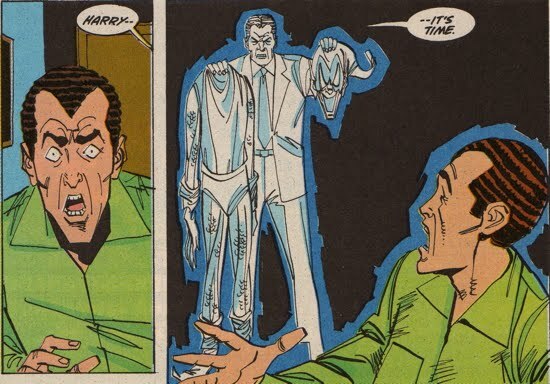 Years later, Norman also appeared to Harry in Spectacular Spider-Man #178, sending Harry down a dark path as he once again attacked Peter Parker. For more on the effects Norman had on Harry during the years he was thought dead, see this article. 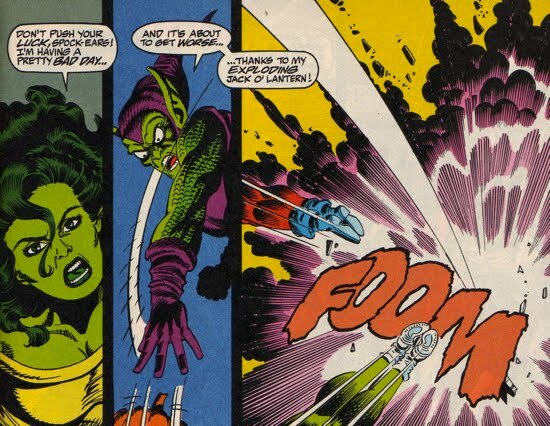 The Goblin's next appearance in the afterlife also involved an encounter with the She-Hulk, this time however, it was the She-Hulk who was dead. After the Rumbler had buried her in a pile of stones and rubble, the She-Hulk was found dead in L.A. An off-beat tale through the afterlife followed in Sensational She-Hulk #53. 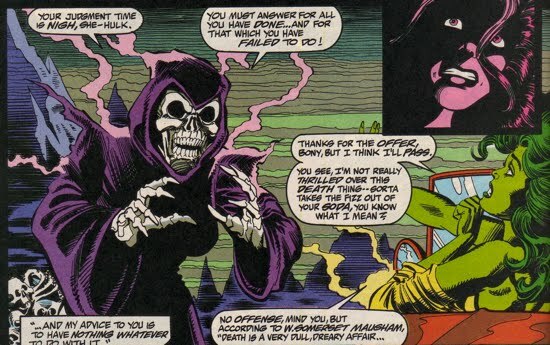 The She-Hulk suddenly found herself in the presence of the Mistress Death, but since Death had a rather grim message for Walters, she split and followed the 'bright light' ahead of her. Instead of finding the pearly gates, She-Hulk arrived at a shopping mall?!? Not just any shopping mall, the Postmortem Mall, which was a bridge between the realms of bliss and torment. 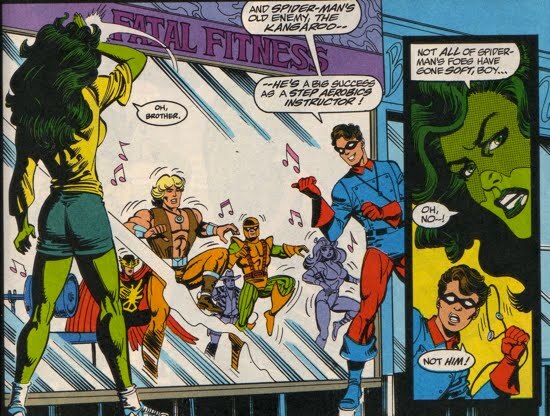 Upon arriving, She-Hulk was greeted by Buck Barnes (who, interestingly, was also amongst the Legion of the Unliving back in Avengers Annual #16), who proceeded to give her a tour of the afterlife. Bucky explained to her that numerous former villains have made a change for the better in the afterlife, but just as he was finishing his statement the Green Goblin attacks the duo! The Green Goblin was one of the few villains that still enjoyed 'the pursuits of evil'. A ruckus ensues as the Goblin battles both Walters and Barnes at the same time. 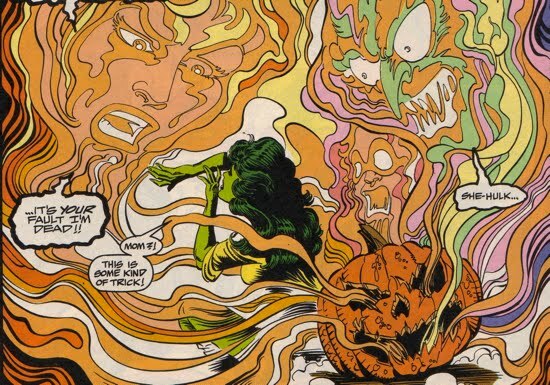 Once again, the Green Goblin breaks out his hallucinogenic gas in an attempt to subdue the She-Hulk. The hallucinogen sends She-Hulk on a trip through her past and she overcomes the toxin after she resolves to not let anyone else die. She then pummels the Goblin, who was about to kill Bucky Barnes. 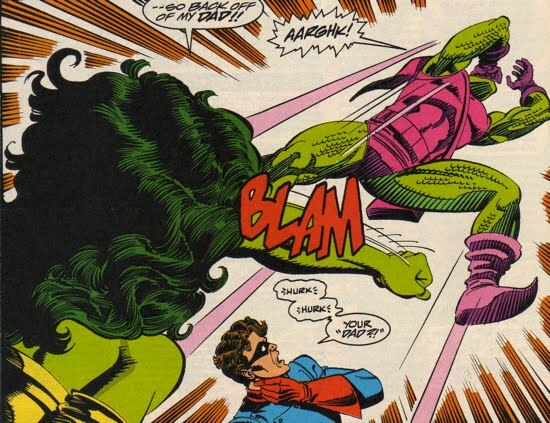 She-Hulk's relentless attack against the Goblin only ceased after Bucky pleaded with her to stop. Walters then tosses the Goblin off to side (very anti-climatic) and it was soon revealed that the Zapper was going to find a way to resurrect She-Hulk. The Goblin was not seen amongst the dead after that incident. How does one explain the Green Goblin being amongst the dead even though he was alive and well living in secrecy? Not a bad trick, Norman even had Death incarnate convinced that he was dead. There's really no good explanation for this other than to say that the experience of death is in the eye of the beholder (to a certain extent) and if someone believed that the Goblin was dead, then perhaps their subconscious populated the afterlife with their version of the Goblin. Or perhaps the impact of the Gwen and Goblins death was so great, that many believed the spirit of the Goblin was terrorizing the afterlife in the same manner that he terrorized the mortal plane. Or perhaps the body behind the Goblin attire was the vagrant Norman killed and had placed back in the morgue as a body duplicate, who knows? 1. The X-Men villain Mimic (who was believed to be dead) was seen at the Postmortem Mall in Sensational She-Hulk #53. Norman Osborn would later recruit Mimic to join his Dark X-Men team. 2. Bucky Barnes was resurrected amongst the Legion of the Unliving in Avengers Annual #16. He then fought the Green Goblin alongside the She-Hulk in Sensational She-Hulk #53. Norman would later battle Bucky after he had taken over the mantle of Captain America. 3. The Moon Knight battled the Green Goblin during the Grandmaster's plan to defeat the East and West Coast Avengers. Norman would later set his sights on taking down the Moon Knight during his tenure with the Thunderbolts as well as during his Dark Reign. Both attempts failed. 4. Hawkeye (aka Clint Barton) was amongst the Avengers that faced off against the Legion of the Unliving, he and Norman would share a personal war that nearly got both of them killed during Osborn's Dark Reign.